Description: The column of this burrowing sea anemone is elongated with a rounded base and is not divided into regions. There are 12 tentacles that are very long when fully expanded. The column is whitish, the tentacles are brown or reddish with white spots near the base; other colours may occur. The span of the tentacles may be up to 150mm. Habitat: Burrows in sand or gravel, excusively sublittoral, occurring at depths. Nocturnal, expanding above the substrate only during darkness. Distribution: Recorded in Britain from western Ireland at 10-25m and from the southwest of the Isle of Man at around 10m. Also from Camaret-sur-mer at the entrance to Brest in Brittany. May be more widespread than records suggest. Similar Species: Another nocturnal anemone has been observed in Scotland and Guernsey, it is probably another species of Halcampoides. 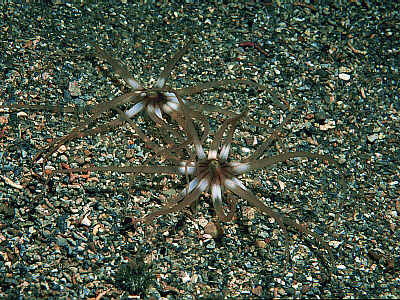 Peachia cylindrica is the only other burrowing anemone likely to be confused with this species, but it has much shorter tentacles and different coloration. Elongated column with rounded base. Picton, B.E. & Morrow, C.C. (2016). Halcampoides elongatus Carlgren in Stephens, 1912. [In] Encyclopedia of Marine Life of Britain and Ireland.